Facebook launched a bunch of new features Wednesday, including group chat, a redesigned chat user list, and the biggest of all, video chat via a partnership with Skype. It’s this last one that will have the biggest implications for most average Mac users. 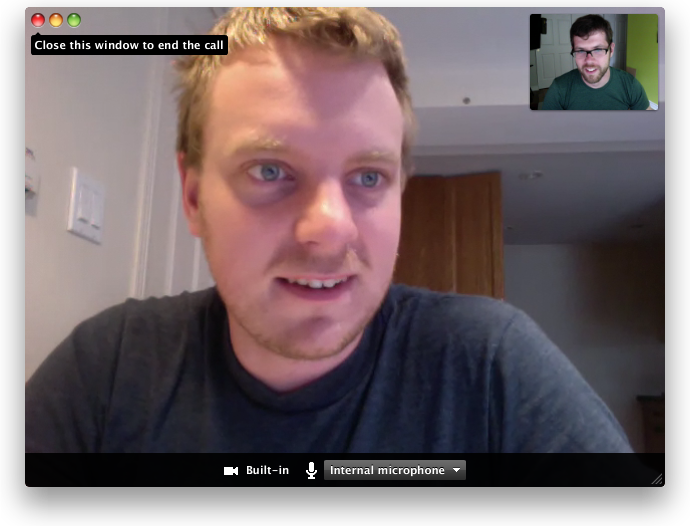 I used Skype video calling approximately three minutes after it launched (with pal and web developer Wes Bos), and it worked perfectly. Installing the plugin on my iMac (s aapl) required a tiny Java (s orcl) app download that’s virtually foolproof to use, and making and receiving calls is as simple as clicking a few buttons and confirming you want to share video. Video chat doesn’t appeal to everyone. It works well for people who have close relationships with one another (like parents and children) and who live far enough away from each other that face-to-face interaction is rare. But when you add the complication that both parties have to install a dedicated app and have that app open and active, the pool of people who’ll actually use it are even smaller. With Facebook chat, if they’re in your network, they’re potentially available for video calling. No Skype registration, no calling people ahead of time to tell them to open the Skype client so that you can call them, since people are much more likely to be Facebook users (there’s 750 million of them, Facebook announced today) and online at any given time on that site. Skype’s Mac client also isn’t winning over any fans in terms of its design, mainly because that design feels unnecessarily cumbersome. Facebook’s Skype integration is the opposite of that: It’s invisible, blending in with Facebook’s web presence without drawing too much attention to itself or changing the Facebook experience that users are comfortable with. For both the above reasons, I think Facebook Video Calling will unseat Skype as the video chat option of choice for Mac users, at least when it comes to consumers. Pro users might need the advanced Skype features offered through the dedicated Mac app, but some of those might make it to Facebook eventually, too, it was suggested at today’s press conference. And things like calling out to landlines and cell phones might be better handled through Skype’s smartphone clients anyway. Facebook still has to bring video calling to groups and mobile, but the groundwork is laid for that to happen, and while some are saying Google+ (s goog) is still in the lead thanks to its Hangouts group video chat, I think that’s underestimating Facebook’s advantage in terms of its huge network size lead. I’m seeing a lot of negative reaction to this announcement on Twitter in general, but I think it will do wonders for the adoption of video calling among less techie users. What do you think? the new fb video chat option is nt available on my macbook pro….do i hav to download it???? Why do half the gigaom articles claim x will replace y ? Tables will replace laptops , smart phones will replace computers, etc ect etc. Thee is a world outside a narrow view of new technology, its called the real world, I would never use Facebook to Skype half the folks I know, my smart phone is just a backup when I’m not at a purer, and try running PhotoShop, finalcut pro or any real software on your iPad. We get you all like new technology, but sensational giddy headlines don’t make it so. Sorry, but to make this claim, especially with your dramatic headline “…will replace…” is for one, naive, and two, just plain wrong. You’re assuming that all Mac users who use Skype for IM and video chat either have a FB account, or trust FB enough to want to shift all their video conferencing to FB as a central hub. Sorry, but that’s just not gonna happen. I used it last night and it was probably the most simple integration of all time. I called a friend not likely to be too computer savvy, they said “wtf” and then had it all set up in 30 seconds without me saying anything. Very simple and very cool to use. Forget having to have applications open, as the myopic author states. I use FB because it’s a good business tool but I am always unavailable for chat, just like in the days of AOL and as today with Gmail. Always unavailable. And I’ve never used MSN (or whatever MS is calling it this month). Once available for chat, all sorts of people who you hardly know are pawing at you for your time – demanding an immediate response. No thanks. I prefer email. LOL – I just looked at my FB page and there’s an exclamation point at the bottom, “Facebook chat is experiencing technical problems at this time.” So much for launch day! They must have outsourced to Microsoft. Why in hell did you have to add the UGLY new share bar that floats at the bottom of my browser. No thanks, I am even going to leave Facebook. That presumes you want a Facebook account and will allow the Facebook weasels to do whatever they can to monetize your personal information. No thanks. It won’t for me. I won’t sign up for Skype because it’s owned my Microsoft. It took me a long while before I even joined Facebook simply due to Microsoft’s partial ownership. NOTHING that has the eternal stench of Bomber and his gang of flying monkeys from Seattle on it will NEVER come anywhere close to my Mac… NOR will Zuckerberger’s swill….